As students continue to grow and mature, our program and school grows alongside them. 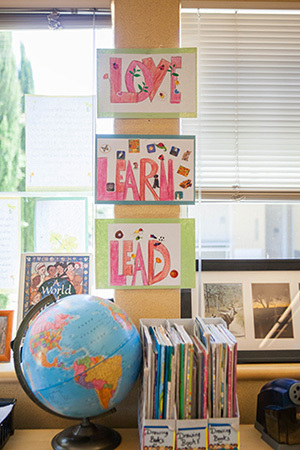 The words Love Learn Lead become more meaningful as students put thoughts and ideas into action across all curricular areas. As students enter the upper school years (grades 5-8), our teachers challenge them intellectually, support them emotionally, and treat them individually as they undertake more complex academic and personal pursuits, culminating in their capstone year-long 8th grade service project. The Upper School schedule incorporates longer class periods to allow for in-depth study and project-based learning. In addition to longer periods, students spend nearly 50% of their day in split cluster classes, offering the opportunity to be in the science lab, English class, music, art, and Spanish language lab with a 12 to 1 student teacher ratio. Our interdisciplinary curriculum ensures students go beyond learning a single subject, fostering an understanding of how all disciplines are related. Education at Presentation School extends beyond the classroom and boundaries of the school, as students partner with local and international organizations to help address complex local and global problems. The middle school years at Presentation School offer the best of all worlds: an exciting, dynamic curriculum, and the smaller class sizes so critical to individualized learning. Our “split” design schedule allows middle school students to meet three times a week for language arts instruction in groups as small as 10 students. Such small and flexible grouping allow for personalized support and acceleration. Language Arts blocks are blended with Social Studies and Faith, creating an integrated Humanities approach to learning. Students learn, create, and explore different writing styles through the use of technology and 6+1 Writing Traits curriculum. Writing is taught as a process, building upon the basic skills developed in Lower School. Presentation Upper School teachers have developed school-specific benchmark language arts skills, in which student progress is measured. Presentation’s Upper School Math Program provides tailored instruction and small class sizes to ensure the most appropriate and meaningful math experience and sequencing for students. All courses cover foundational math concepts, as well as building skills in estimation, logic and problem solving. Placement in the appropriate course sequence is determined by past math performance, placement exams, teacher recommendation, and student interest. In addition to their math course placement, all Middle School students participate in a week-long, integrated STEAM project in the second semester. This dedicated project week explores the connected disciplines of Science, Technology, Engineering, Art and Math, and challenges mixed-grade teams to plan, design and build a solution to a real-world challenge. All students take Math 5 and Math 6. These two, year-long courses reinforce students' knowledge of operations of whole numbers including addition, subtraction, multiplication and division, and then extends those skills to decimals, fractions, and mixed numbers. Students are introduced to integers, percent, perimeter and area, and basic equations. Algebra Readiness 7 and 8 is a two-course sequence that provides a deeper exploration of integers and rational numbers, numeric and algebraic expressions, and introduces methods to represent and solve multi-step equations and inequalities. Students are introduced to and deepen their understanding of percents, ratio and rates, area and volume, and probability and statistics. This sequence prepares students for Algebra 1 in freshman year. Pre-Algebra and Algebra 1 is a two-course sequence that begins in Pre-Algebra by building the key foundations and problem solving skills needed for success in Algebra. 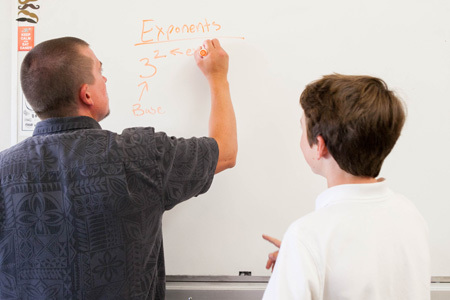 The Algebra 1 course introduces and deepens students' understanding of equations and inequalities, functions, systems of equations, polynomials and factoring, radical expressions, and data analysis and probability. This sequence prepares students for Geometry or Algebra 2 in freshman year. Honors Algebra is offered for students who have completed Algebra 1. This course delves into Algebra 2 topics including linear systems, quadratic, polynomial and exponential functions, matrices, imaginary numbers, and statistics. This course prepares students for Honors Geometry or Honors Algebra 2 in freshman year. Upper School students learn through a hands-on, real-world approach to exploring the scientific world in our well-equipped science lab. Through field experiences, labs, guest speakers, and an enriched curriculum, students are inspired to know more about all aspects of the natural world and the scientific underpinnings of human knowledge. 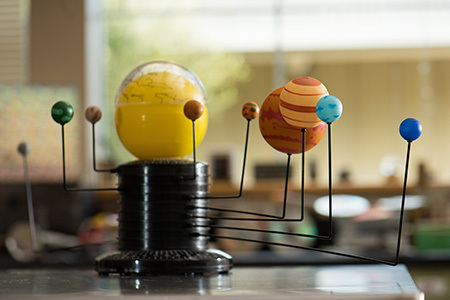 In Earth Science students study the Solar System, Water Cycle and Earth's Weather. Students return with fresh eyes to the Chabot Science Center and experience the "Mission to Mars" simulation. In Life Science Students study Plant and Animal Cells, Plant Structures and Functions, and learn the systems of the Human Body. The highlight in this unit is dissecting sheep hearts. In Physical Science we study Types of Matter and Changes in Matter. In the spring we take an overnight field trip to Occidental to study the Redwood Forest Ecology and Coho Salmon. STEAM (Science, Technology, Engineering, Art, and Math) education is essential for our future economy as well as our kids' successful leadership in the world. STEAM-related occupations are, and will continue to be, the fastest growing and highest paid jobs in the U.S. For elementary and middle school students, early STEAM education reinforces critical thinking and problem solving skills that set the foundation for greater learning in high school and beyond. By teaching our students through STEAM, they understand why and how Science, Technology, Engineering, Art, and Math are tied together by classroom learning and by hands on experience. Although STEAM is embedded throughout our curriculum, our middle school students all look forward to STEAM Week(s). During this time, regular classes press pause and students spend 5-10 days immersed in a mixed-grade team, working on a specific STEAM challenge. Our first, 2015 STEAM challenge was a teacher-designed Mini Golf Hole Design project. In 2016, Presentation expanded our STEAM project and began a partnership with the San Jose Tech Museum and did a comprehensive study of earthquakes and engineering, culminating in the Presentation Great Shake Down. The 2017 STEAM challenge theme was Taking Flight. Science, Technology and Engineering were applied to help understand how and why and what makes planes and gliders soar through the air. The middle school students took a STEAM field trip to San Mateo’s Hiller Aviation where they participated in a Physical Science program to learn about flight before competing in teams engineer, develop, and construct a soaring glider that could clear an obstacle and land on a designated landing pad. Upper School History is part of the Presentation Middle School Humanities Block and is integrated with English and faith. Although each grade has specific benchmark learnings and themes that run throughout the year, the emphasis is on learning these topics in meaningful context, reflecting on the impact of historical events on our modern world. Students learn how to study original documents, analyze for accuracy and bias, and compare and contrast them with modern events. 6th grade social studies focus on the different ways humans interact with their environments through work, art, recreation, and thought. A comparative study of ancient civilizations of Mesopotamia, Egypt, and China develop a frame of reference to understand and appreciate cultural differences and contributions. The Roman Empire is studied during the year, with an emphasis on how Greek and Roman government systems heavily influenced the establishment of the United States legal and governing structures. Students augment their studies with a trip to the Rosicrucian Museum in San Jose, to examine artifacts in the largest Egyptian museum west of the Mississippi. 7th grade students explore Medieval Europe and Asia, while exploring the feudal system, the rise of towns, the social codes of knights and royal courts, castles, the historical influence of the Roman Catholic Church, the Crusades, and the development of arts and sciences during the Middle Ages. Students explore world religions in faith, including the rise of Islamic Empires, and continue on to the Renaissance and Reformation. Eighth grade Social Studies leaves the ancient past and turns to an exploration of to our country’s origins. Students study the first expeditions of the United States, the pilgrimages that formed our nation, The French Indian War, the American Revolution, Civil War, and World War eras. The culminating experience for 8th grade students is the Washington DC trip, where they retrace the stories and steps of our Country’s remarkable history. Upper School Spanish at Presentation moves beyond listening and speaking to include learning fundamentals of reading and writing and grammar. In addition to expanding vocabulary and grammar, students learn the "why" behind the rules and how Spanish language differs from one country to the next. Students focus on understanding Spanish through hands-on practice, and engaged listening, speaking, reading and writing activities. Students work in small groups and individually to practice pronunciation, perform skits or plays, read and write letters or dialogues, and listen to audio pieces and music, or watch films and videos in Spanish. Students in Spanish experience being out in their community in situations that they have to communicate in Spanish, and interact in a California context, where Spanish is the growing language of the majority of our neighbors. Use adjectives to describe people, animal and places. Begin to present basic information in the target language. Accurately respond and ask basic conversational questions. Express feelings, emotions, agreement and disagreement and opinion in the target language. Make affirmative and negative statements on familiar topics. Recall and begin to use previously taught vocabulary. Express possession using singular possessive adjectives. Begin to use reflexive verbs and direct/indirect object pronouns. Use adjectives to describe people, animal and places in detail. Use the correct conjugations for -AR, -ER, -IR regular verbs in the present tense. Use the correct conjugations for some irregular verbs, including “Ser” and “Estar” (Verb “To Be”), “Tener” (Verb “To Have”) and “Ir” (Verb “To Go”) in the present tense. Begin to use the correct conjugations for some basic regular verbs in the past tense. Presentation School strives to teach and guide students on responsible technology use to ensure that wisdom grows along with skill. Students live in an increasingly technology-saturated world, and being able to navigate an ever-changing digital terrain is a critical academic and personal skill. At Presentation, technology is integrated within the curriculum, creating an authentic learning environment, where students learn to use the appropriate tools to support their classwork. 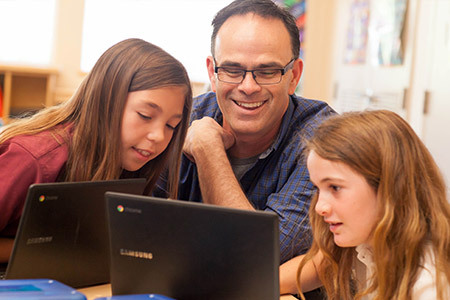 Students in grades 3-8 experience our 1:1 Chromebook program. Presentation is a Google Apps for Education School, allowing students an integrated, real-world platform for research, writing, collaborating, presenting, calendaring, and student organization. In addition to technology integration, Presentation School students learn keyboarding, and are offered technology electives that allow students to explore interactive programming, web design, video production, and introduction to robotics. Students are introduced to the foundational elements of computer science and reflect on ways that current and emerging technologies are shaping our world. Children and their families are unique in their personal values and beliefs. At Presentation, these values and traditions are honored, while still providing a shared foundation for the spiritual exploration and the social and emotional development of our students. Monthly liturgies, celebrated with our entire K-8 community, follow the liturgical calendar of the Catholic Church, and build upon a character/gospel value, challenging the community to apply that value to their personal lives. Middle school students expand on monthly liturgy themes and learn to appreciate the connections of religious understanding to the world and history. 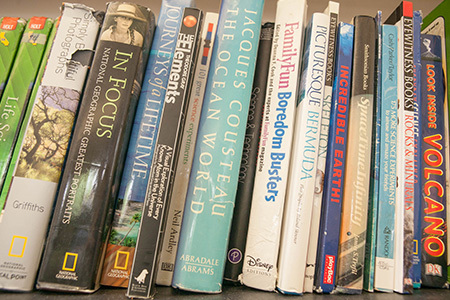 Our Humanities model allows students to explore the connections and complexities of religion, informed by the arts, sciences, literature and history. Sixth grade students complete an in depth study of the Old Testament alongside their study of ancient cultures, finding the correlations between a biblical worldview and recorded history. Seventh grade students are immersed in world religions as they study the fall of Rome through enlightenment, and study the ways cultural infusion and religious development influenced the rise, fall, and expansions of civilizations. Students in 8th grade complete their capstone service project, while learning the importance religion has played in the founding of the United States, through the present day. Being a person of faith, and the actions required of us, is explored in the context of understanding what is uniquely American and required of us as citizens.